X vs O Football - Football made simple! 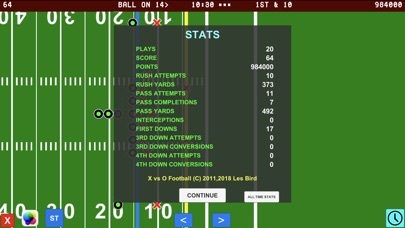 A unique take on the X & O Football game. 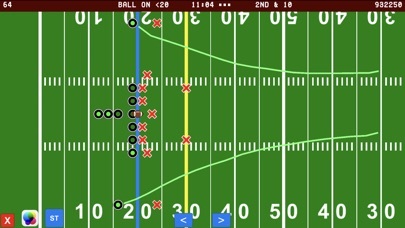 Draw your own routes for your receivers then hike the ball and play. Try to beat the defense and score touchdowns. The game is played with a variable time limit of 2, 5 or 15 minutes, score as many points within this timeframe as possible. You will always play on the offense. The quarterback can run or pass the ball. A backwards pass can be thrown again - try plays like the flea flicker. Defense can intercept the ball which will restart from the original line of scrimmage. 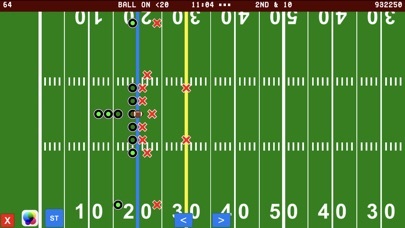 If a first down is not made after 4 tries you restart from the original line of scrimmage. Three difficulty levels: high school, college and pro. The harder the difficulty the higher the scores. 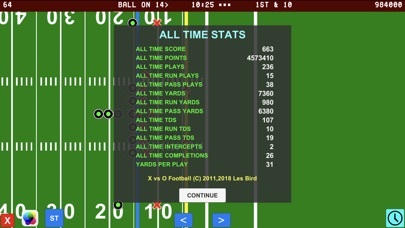 Stats are accumulated such as total yards passing, total yards rushing, total touchdowns scored. A passing touchdown will score 6 points and your team will be awarded points based on yards. A rushing touchdown will score 7 points and your team will be awarded 2x points based on yards. Game Center supported - see how you compare on the global leaderboards.